Hakone Tozan Bus (1 for each 1 hour,20min, ), Taxi (4km from odawara station,15min ), from Odawara station ,west exit . 20 min by Hakone Tozan Bus bound for ikoi no mori ( 1 for each 1 hour) , get off at ikoi no mori and 10 min walking . One adult (18+) may supervise up to four under-18s. ※Price applies to booking of 3 or more participants who are directly related. ※It is for the guide when the participating adult can't play with kids. ※Prior booking is required. On average the Discorvery course takes approx. 1.5 - 2.5 hours.This includes the time required for your safety briefing. Also, it all depends on how speedy you are, and how busy the course is. Yes. Please bring a cloth to change for getting dirty. 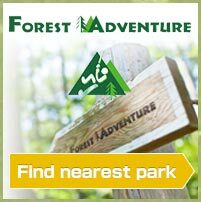 There are now has a Kids course since 16th March 2019 so if you are height over 90cm, you can experience Forest Adventure! 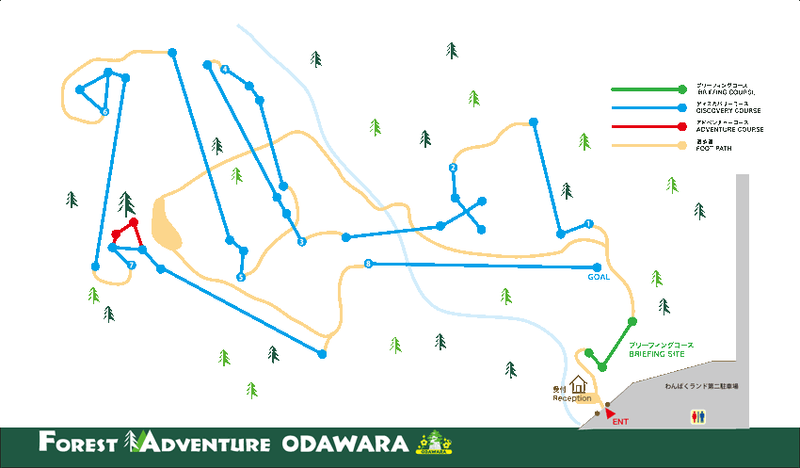 Also there is a park which is free for small kids right next to Forest Adventure Odawara. No. Please come by car or bus , taxi from Odawara station.